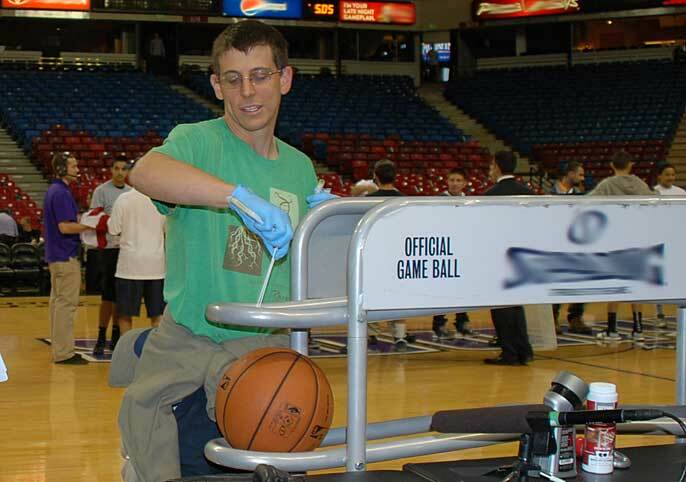 David Coil, a microbiologist at UC Davis, gathers microbial samples from the Sacramento Kings court. Microbes collected from Northern California and throughout the nation will soon blast into orbit for research and a microgravity growth competition on the International Space Station (ISS). This citizen science project, known as Project MERCCURI, is led by UC Davis microbiologists, who are investigating how microbes from different places on Earth compare to each other and to those found on the International Space Station. Six of the 48 samples were taken from locations in Sacramento, Davis and the Bay Area, including the 50-yard line of Candlestick Park, Oakland Raiders field, second base for the Giants at AT&T Park, Sacramento Kings sweat mop, Cal Aggie stadium and a residential toilet in Davis, Calif.
UC Davis microbiologist David Coil and Wendy Brown, a UC Davis biomedical engineering Ph.D. candidate who is also a professional cheerleader and co-creator of Project MERCCURI, are part of the team that gathered and prepared the 48 microbes for the launch at the Kennedy Space Center in Florida. The project is a collaboration of microBEnet/UC Davis with the Science Cheerleaders, an organization of more than 250 current and former NFL and NBA cheerleaders who are also scientists and engineers, Space Florida, Nanoracks, JPL-NASA and SciStarter.com. Over the past year or so, citizen and student scientists used kits to collect microbes from surface areas in buildings nationwide. From the thousands of samples they received and identified through DNA sequencing, 48 beneficial "bugs" were selected for the March 16 launch. The UC Davis team also made baseball cards with images of the 48 microbes and their "stats," including where they were obtained and what their important functions in sustaining life are. "One of our goals is to understand what microbes are living on the International Space Station and how this compares to other 'built environments' like offices, homes and cars," Coil said. "We also want to see how the lack of gravity affects microbes of all kinds. But more importantly, we hope to let people know that not all microbes are bad. The majority are beneficial or harmless, and we need them!" For example, Coil said that the bacteria found on the Sacramento Kings sweat mop, Micrococcus luteus, is used in bioremediation to clean up pollution or toxic waste. The bacteria found on the Raiders practice field by Wendy, Bacillus aryabhatti, is important in plant growth and has been proposed for use in re-vegetation projects. The growth of the microbes in microgravity will be monitored and compared to their counterparts grown in the Department of Medical Microbiology and Immunology at UC Davis and Argonne National Laboratory. The labs also will study microbial samples that the astronauts take from space station surfaces, including computer keyboards, foot rests and bench surfaces. Project MERCCURI also will conduct a growth competition to see which microbes grow the best in space. "We want to engage citizen and student sciences in this research and science in general," Brown added. "We're using the microbial playoff and involvement of cheerleaders and professional sports teams as a fun way to keep people interested and involved." All details about the project, including photos, copies of the baseball cards and real-time results of the study will be posted online at spacemicrobes.org. The site also will ultimately include free interactive visualization tools and lesson plans for teachers. Other members of the Project MERCCURI team include microbiology team leader Jonathan Eisen, professor of medical microbiology and immunology at UC Davis; Darlene Cavalier, founder of SciStarter, an online citizen science community, and Science Cheerleader; Jenna Morgan Lang, a project scientist in the Eisen lab; Russell Neches, microbiology graduate student in the Eisen lab; Mark Severance, NASA Human Space Flight Network Director at the Goddard Space Flight Center; Summer Wagner, aerospace engineer at the Johnson Space Center; Debbie Biggs, owner and president of Education Pathways; Holly Bik, a computation biologist in the Eisen lab.